Harvesting existing cropland more frequently could substantially increase global food production without clearing more land for agriculture, according to a new study from the Institute on the Environment (IonE) at the University of Minnesota. The study, published in Environmental Research Letters, tracked global harvest trends of 177 crops between 1961 and 2011. It found that the total amount of land harvested increased four times faster than the total amount of cropland between 2000 and 2011, suggesting that harvest frequency was on the rise. This led the authors to wonder if there might be additional gains to be had by strategically increasing cropping frequency. “Could existing arable lands get more frequent harvests, and what is the upper limit?” asked Deepak Ray, lead author of the study. To answer that question, he introduced a new concept: harvest gap. Harvest gap is the difference between actual per-year harvest frequency and the maximum potential frequency. Ray and the study’s co-author, IonE director Jonathan Foley, estimated that on average an extra harvest is being missed globally every two years due to the presence of this harvest gap. 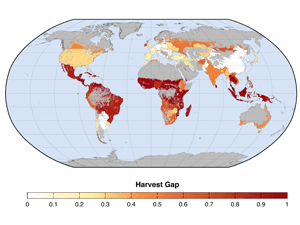 The researchers found that Africa, Latin America and Asia have the highest concentration of potential harvest gaps. Brazil, for example, which on average harvests its croplands nearly once per year, has a harvest gap of 0.9, suggesting that on its current arable lands a second harvest is possible each year. Closing the gap would boost crop production on existing croplands without resorting to further clearing for agriculture, and so could potentially reduce the pressure to destroy additional rain forest. Increased harvest frequency also holds potential for mitigating risk under a changing climate. Worldwide, the researchers found that closing harvest gaps worldwide could theoretically boost production more than 44 percent. Ray notes the study amounts to “scientific eyeballing,” since only national data were available and only for 177 crops. To fully quantify the potential impact, more local data would be needed, and local farmers would have to weigh the benefits against the costs of additional harvests, which may turn out to be prohibitive. In addition, the researchers note that efforts to increase crop harvest frequency must also be wary of leading to deterioration of soil, water and the agricultural land base. “Depending on local environmental conditions, agronomic practices and social contexts, increasing cropland harvest frequency could present a short-term gain in crop production, with long-term losses in agricultural yields and environmental conditions. Only if increasing frequency of harvests can be done sustainably is this strategy a potential way to address some of the challenges of crop production and food security,” they write. Localized studies suggest that farmers around the world already are benefiting from increasing the number of harvests. “Introduction of second crops, generally corn following the primary soybean crop, has increased local incomes across economic sectors,” the report noted. Countries in which cropping frequency already is increasing include Brazil, India and China; however, others, including many African nations, have shown a decline in recent years. More frequent cropping, the authors said, represents a potentially powerful “third way” of increasing food production, in addition to expanding cropland and increasing harvest yields, both of which are widely studied by IonE researchers. July 23, 2018 - Organic approach to boost soil biology Farm WeeklyCARBON Ag Solutions has invested heavily in using organic carbon in Western Australia, creating two ways to get the carbon into the soil.